Because by now I have realised no matter how much you try, certain things are just not achieveable. Sigh!!! But thank God for winter and cooking. 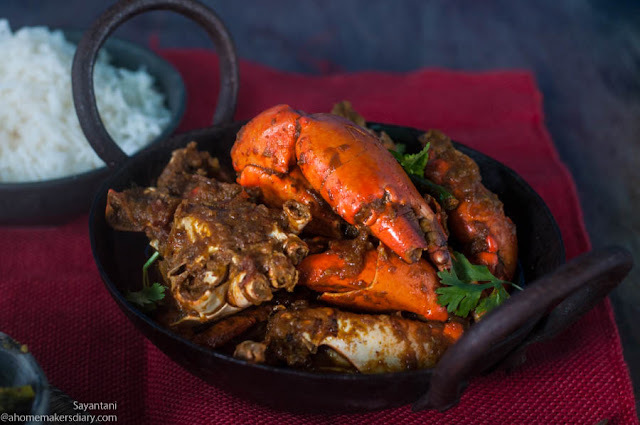 When most things are beyond your control you at least know that river crabs in winter are the tastiest....and a properly made Kakrar jhal (Crab masala) has the power to make you feel, everything is right with the World. No it does not solve any problem but reminds you that there is always next year to nurture your nesting instinct once again. 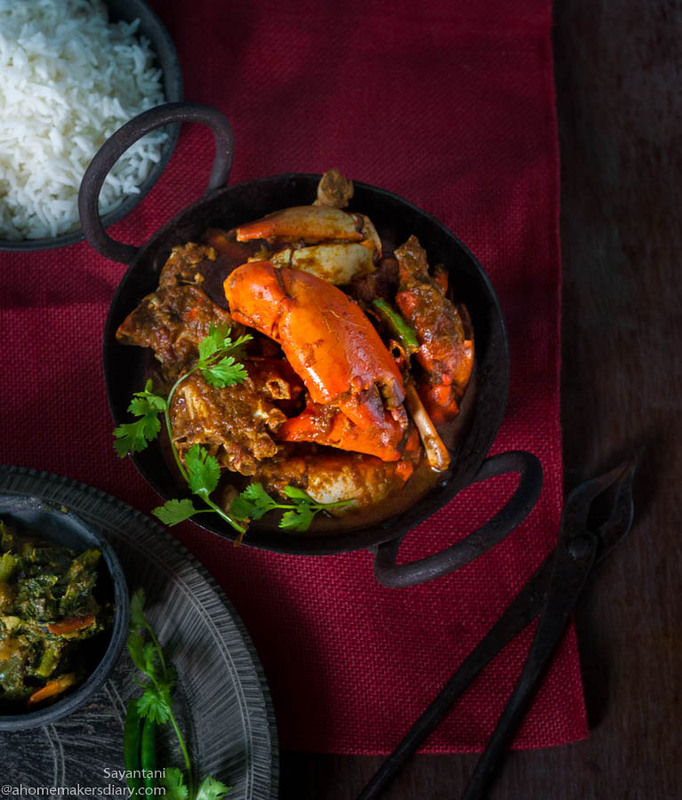 This is my Maa's recipe and may be your maa's too. The simplest of recipes but slow cooked. Maa always used to clean and cut the crabs and now either the fish monger or my husband does it. Once it is cut you need to separate the orange looking brain in another small bowl. using a brush loosen all the mud and dirt from the shell. Wash under running water. Cut the body in half and with the back of your knife or tong break the crab claws at places. In the mean time chop the onions very fine. Cut tomato in small pieces. Heat 2 tsps of oil and fry the crab pieces for just a minute. Stir in between. DO NOT FRY THE BRAIN/GHILU. Take out and keep aside. Now heat the rest of the oil and add the onion. Fry on medium with a small sprinkling of salt. fry the onion for 8-10 minutes. I prefer to sprinkle some water from time to time to aid in softening and proper cooking. Then add the ginger garlic paste, turmeric, chili powder and cook for 3-4 minutes and finally add the tomato. Sprinkle more salt and mix. Cover. Let the tomato get soft and then mix everything together to a homogenous mixture. This would take another 6-8 minutes. Now add 1 and 1/2 cups of warm water, slit green chillies. Adjust seasoning if needed and once it comes to a boil place the fried crabs in it. Carefully drop the ghilu and cover. Stir from time to time for even cooking. Cook on medium till the gravy thickens. Check seasoning, adjust if needed and finally sprinkle the garam masala on top.